Telling the story together with children. This was one Christmas adventure that had it all. Young heroes, bad guy professors as well as both slick and depressed reindeer. But when the story was set, one would find the next pages on the virtual online Christmas book to be blank. Not only should the children read the story, it was a competition to come up with both the best words and drawings to get the story rolling throughout the four weeks leading up to Christmas. All submitted material was scrutinized before the winning continuation of the story was included in the book and recorded by an actor as well, before the story and the competition moved forward, guided by the story editors. At the end, the devious Professor Grihm was defeated, and a 12-year old girl won a trip to the Lalandia holiday resort along with her family. 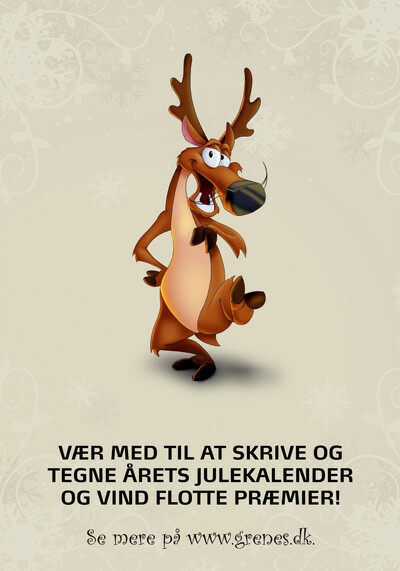 Store poster with the words "Join in to write and draw this years Christmas calendar and win great prizes! 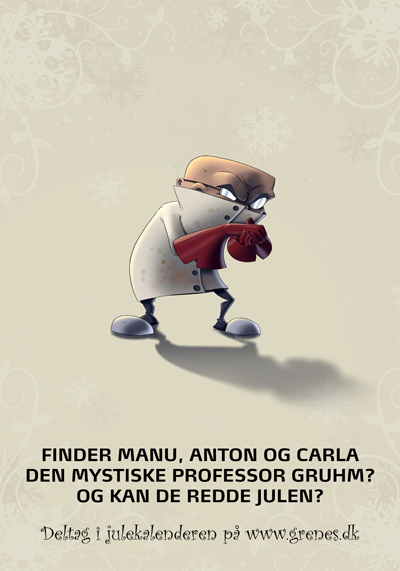 Visit www.grenes.dk"
Store poster with the words "Will Manu, Anton and Carla find the mysterious Professor Grihm? And will they be able to save Christmas? 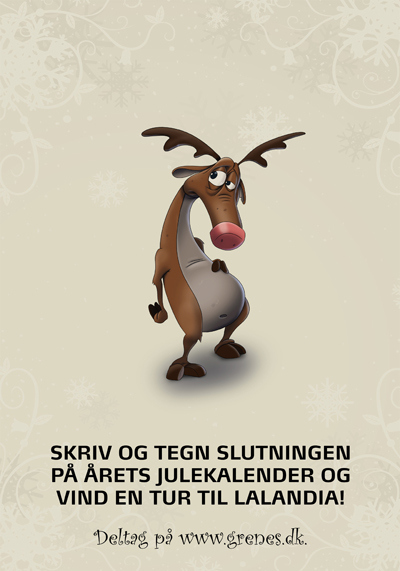 Join the Christmas calendar on www.grenes.dk"
Store poster with the words "Write and draw the end of this year's Christmas story and win a trip to Lalandia. Participate on www.grenes.dk"